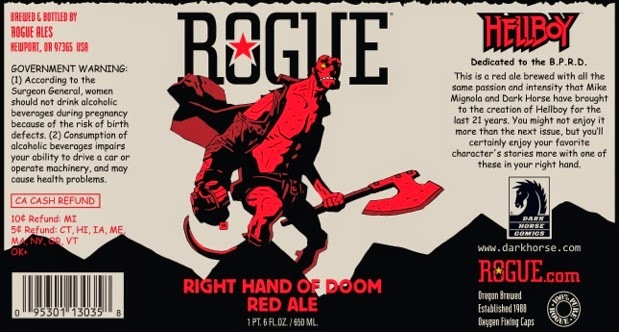 Something to Muse About: Hellboy gets his own beer: The Right Hand of Doom! Hellboy gets his own beer: The Right Hand of Doom! Portland, OR, February 18, 2015—To celebrate the 21st anniversary of Mike Mignola's legendary Hellboy character, Dark Horse Comics and Rogue Ales have collaborated to create the RIGHT HAND OF DOOM, a limited edition beer that will be available online beginning February 22, 2015 at www.rogue.com. The RIGHT HAND OF DOOM label features a Hellboy drawing by Mignola. The beer will be available for the first time publicly at an event at Things From Another World Comics store in Portland on Friday, February 20 at a signing with Mignola and fellow comic book superstars Matt Kindt (MIND MGMT), Eric Powell (THE GOON) and Brian Wood (REBELS). 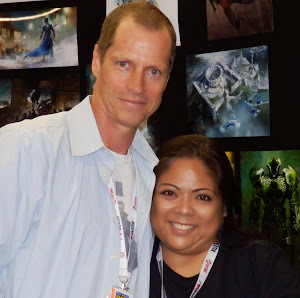 The event begins at 4 PM, with Mignola’s signing scheduled for 6 PM. The beer will be available nationally via http://buy.rogue.com/Rogue-Hellboy-Right-Hand-of-Doom-Red-Ale; pre-orders are now available.